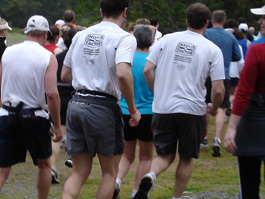 The start of a 10k race in Marin. 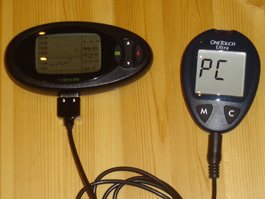 Dexcom receiver calibrating with the Lifescan Ultra meter. The first sleepover with my new friend Dexcom was very comfortable. Even though we didn't tell scary stories while falling asleep, which is my favorite sleepover pastime, Dexcom did have lots of continuous glucose information to share the next morning. I woke up with a Dexcom reading of 152 and an Ultra reading of 157. After calibrating the sensor, I looked at the nine hour trending graph to analyze my overnight BG's. The data points were in a fairly straight line, hovering around the 140 value plus or minus 10 points. Interestingly, at 7:00am the BG line spiked up above 200 and then gradually fell to my waking reading of 152. "Looks like I found my Dawn Phenomenon," I thought to myself, "Maybe I should reexamine my early morning basal rates." I decided to collect more data before making any changes. 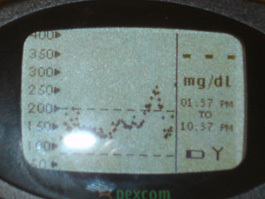 I must say that without the software download, it is very difficult to analyze Dexcom's BG trending data, especially when using nine hour graph. First of all, you can't go back and look at the actual BG data points, so you must estimate to the nearest 10's place. Second, the horizontal (or "x") axis doesn't have hour labels, so it's very hard to determine which time corresponds to the particular BG trend of interest. Lastly, the screen times out in 15 seconds, so once you estimate the BG and time, the screen goes blank and hitting the buttons doesn't remedy the problem. 1. Is this the one, three, or nine hour graph? 2. What was my BG at 9:45? 3. At what time did my blood sugar start to rise? 4. What was my BG before the rise? 5. At what time did my BG peak? 6. What was my BG at that peak? 7. What changes should I make to my diabetes management based on this info? 8. Where were you on the night February 11th? Just kidding. Do you see how this could be difficult, frustrating, and time consuming? In order to take full advantage of Dexcom's valuable continuous glucose information, I need the right tools (software) to interpret the data. My BG's were fairly steady throughout the day, hanging around the 130 range. I had a few postprandial rises, but my meal boluses eventually brought the BG's down nicely. It really is amazing to see my BG's in action. Late afternoon, a friend (who also has diabetes) called and asked if I was still up for a run. I said yes and told him about my new friend Dexcom. 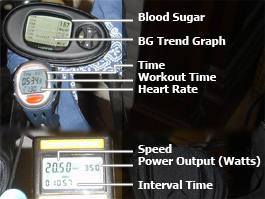 I did my usual pre-aerobic workout routine of BG check (145) temporary basal rate decrease (80%), carb snack (45 grams), turn my heart rate monitor on, lace up my shoes... Now I'm ready to go. I wasn't quite sure where to put my Dexcom. I could almost guarantee it wouldn't stay clipped to my shorts during the run. I ended up using a neoprene iPod carrying case. Dexcom fit perfectly. When my running friend arrived, I showed off my new sensor, but when I hit the receiver button, it wasn't getting a signal from the transmitter (no "Y" antenna on the display). I think my heart rate monitor (Polar S520) was causing some interference with Dexcom. I figured since the same problem worked itself out the night before, Dexcom should get a signal in a few minutes. We started our run heading towards the San Francisco Bay. Thirty minutes later, we reached the base of the Lion Street steps and I still didn't have a signal. Extremely frustrated at the lack of BG data, I took off my heart rate monitor and started running up the steps. It had been a while since I had run those stairs and I felt my body switch from aerobic to anaerobic mode. 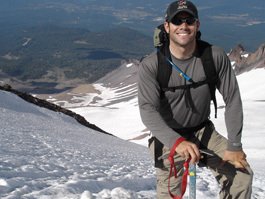 When I reached the top of the steps, I heard a series of loud beeps coming from Dexcom. The receiver screen read "HIGH" with a corresponding BG data point of 400. "This can't be right?" I thought to myself. Besides feeling a little winded, everything seemed fine. I didn't have a meter with me to confirm, but was almost positive I wasn't 400. My friend and I ran down the steps, up again, back down, and headed for home. Ten minutes later, Dexcom was still reading "HIGH" but I felt low. A little shaky and light headed, I ate a tube of glucose tabs and a Clif Shot energy gel. After walking for a few minutes, I felt better and we ran home in fifteen minutes. I immediately checked my BG with a finger stick and it read 87, although the Dexcom still read "HIGH." I calibrated the receiver and within a few seconds, Dexcom read 260. Over the next hour, the receiver stayed in the mid 200's and eventually prompted me to replace the sensor. I didn't (and still don't) know what to make of this experience. Maybe the lost signal combined with the intense anaerobic exercise severely skewed my sensor readings? I talked to my rep about my experience and she asked the Dexcom engineers to look into the heart rate monitor issue. I will be disappointed if I can't use my heart rate monitor and Dexcom together, since the two are such great tools to measure athletic performance. I'll keep you updated once I hear something from Dexcom about the issue. So, I initialized a new sensor, waited two hours for calibration, and Dexcom was back on track. Obviously, my new friend and I are still getting to know each other. I hope tomorrow isn't as weird as today has been. Me climbing Mt. Shasta in July 2005. Workout gadgets: can you say "Data Overload"? The tools of the trade. 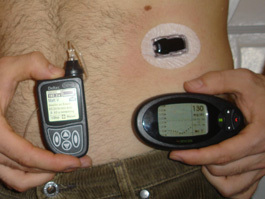 Dexcom receiver and Cozmo Insulin Pump. 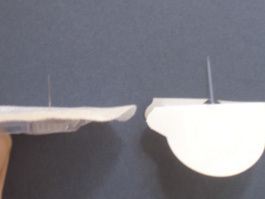 Dexcom sensor catheter (left) vs Comfort infusion set (right). I feel like a big balloon full of information that's ready to burst at any moment. Where should I start? I guess the beginning of the story would be the best place to start. After I heard the Dexcom continuous glucose sensor was available to purchase ($500 plus $35/sensor) I couldn't fill out my order form fast enough. Customer service asked for a credit card number, prescription from my physician, and a shipping address for two day delivery. Real time continuous glucose sensors have been a dream of mine since I was first diagnosed with type 1 diabetes over 16 years ago. It's true that I've had success managing my diabetes with conventional finger stick testing and haven't let diabetes slow me down. However, it would be nice to know which direction my blood sugars are going, especially when I'm sleeping, triathlon training, or at a pizza party. Over the next few days, while waiting for my sensor, I tried to predict the ways this new piece of technology would change my life. In the past I've been burned (quite literally sometimes) by promises of other continuous glucose monitors, watches, and even closed loop systems that all ended in disappointment. Rather than go down the pathway of building up lofty, potentially disappointing expectations, I came up with a short list of hopes for my new Dexcom device. 1. I hope the blood glucose readings are accurate. 2. I hope the trending data is useful. 3. I hope I can use this new information to better manage my diabetes. 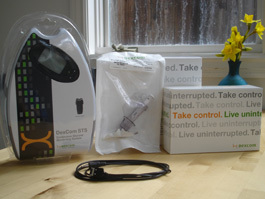 A box arrived via FedEx and I ripped it open to find my Dexcom starter kit (receiver, transmitter, 2 sensors, receiver charger plug, Ultra cable, belt clip) and a 5 pack of sensors (3 day wear each). The next morning I rushed to my Endocrinologist's office to put on my new sensor with the help of the local Dexcom rep. The sensor must be calibrated by plugging in an Ultra meter and doing a finger stick. Apparently, Lifescan is the only meter company that gives public access to their technical specs. The rep assured me that Dexcom does not receive compensation from Lifescan. You must initially calibrate the sensor 2 times and then once every 12 hours. The sensor is not waterproof. For showering, they recommend covering the sensor with a "Shower Patch" (sold separately, $6 for 10 patches) which sounds like a large piece of IV3000. The patch shouldn't be worn for extended periods of time because the humidity/moisture will interfere with the sensor. The PC software is currently not available, but should be soon. The warranty and expected life is 6 months for the transmitter ($250 to replace) and 12 months for the receiver ($500 to replace). This means there will be more significant costs to me in addition to the $35 sensors. I should have allocated more money to my flex account, oh well. The training and instruction was simple and took about ten minutes. First, I inserted the sensor with ease, after a few practice sessions. I felt a little poke at the insertion site, but it was relatively pain free. Next, I attached the transmitter on top of the sensor with a small breakaway lever. 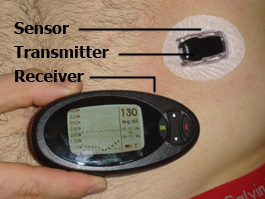 The sensor and transmitter were very comfortable to wear and weren't much bigger than a Comfort/Tender/Silhouette infusion set. The last step was to initialize the receiver and set my high and low BG thresholds. 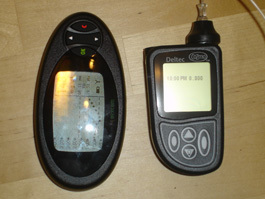 The receiver is an oval device about the size of a cell phone, circa 1998. The sensor has a two hour warm up period and at that time will prompt me to enter two BG readings from my new Ultra meter. it was time to calibrate! I did two finger poke BG tests on the Ultra, using two different fingers. I then connected the Ultra to the Dexcom receiver and within a few seconds the calibration was complete. I couldn't wait to start seeing my blood sugar values and trends. The manual said I should start to see readings within 15 minutes of the initial calibration. Fifteen minutes passed, then 30, then 60. I tried two more calibrations, but it still didn't display my BG's. my first BG appeared on the transmitter, it was 100! Was I in one of those typical meter commercials with a perfect BG? Over the next few hours, I found myself constantly looking at the receiver, monitoring my BG values and trends. The receiver's functionality is pretty simple and basic. You have a BG reading on the top right-hand corner and your choice of a one, three, or nine hour trend graph. There is also a menu function to set the date/time, set high and low threshold alerts, and initialize a new sensor. I was disappointed at the lack of a true history menu. In other words, I can't scroll through to see what my previous BG's have been. I must look at the trending graph and estimate the data points. Without the software, it will be very difficult to analyze my BG data and so my doctor can help me make changes to my diabetes management. On my drive home, the receiver started beeping and vibrating. It was alerting me of a low BG, which was set to 80, and I could see the trend graph had been sloping down over the last hour. To experiment, I drank a bottle of Gatorade and periodically checked my receiver. My BG's started going up! This was the coolest thing to see! The rep and customer service person both called to confirm that my sensor was working correctly. which was good news for me and I continued my workout. After the workout, I felt pretty good, my BG read 92 on the transmitter, but after the finger stick read 62! Well the manual and rep said that there may be a 10 minute delay on BG readings. Due to the intense exercise, my blood sugar must have been dropping rapidly. Next time, I should eat some carbs during my workout. To correct the low and help replace my glycogen stores, I drank a bottle of Gatorade and bloused for about half of it. A few minutes later, my Dexcom was giving a low alert of 65. "Where were you ten minutes ago?" I thought. After a few more minutes, the BG reading rose to 114. I guess this was my first lesson of interstitial fluid versus whole blood glucose values. The shower patch worked well during the workout and in the shower. I had a regular sized dinner of pasta and went to bed with a BG reading of 134 both on the transmitter and finger stick meter. I can't wait to see where my BG's go overnight. Stay tuned and thanks for reading my story.